Our core mission is to ensure that these values remain center-stage, and continue to keep India an exceptional nation. Our strategy is to engage with like-minded people in our great Nation and around the World, who are willing to acknowledge India Ideals that have contributed to our nation’s greatness and to speak with courage to the issues that do not. 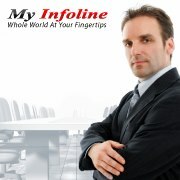 MYINFOLINE -Whole World at Your Fingertips is Internet Based Company offering local search facilities for locating Professionals, Businesses, Organizations and Institutions that have stepped up to the task. Here you can find details of Manufacturer, Whole Seller, Distributors, Retailers, Dealers, B2B businesses, Products & Service. MYINFOLINE forum providing latest local and International News, knowledge about new technologies, gossip of Hollywood and Bollywood, funny photos and Videos to the visitor of site. Listings are completely free; However we invite each Commerce-Partner to make a commitment to the preservation of FREE ENTERPRISE and to the noble mission to: Inspire Tomorrow’s Leaders Today. The (SRT) seal of Honor is awarded annually to each business that makes and renews its pledge annually. Showcase Your Products & Services, Find New Customers.... One or more of our homepage slides. We offer you an unparalleled proposition of value. Contact us today.